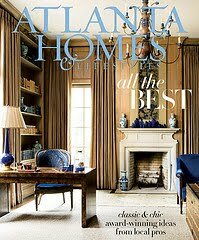 The cover house of the August Atlanta Homes & Lifestyles is one that I have had my eye on for years. When it was being built, I would drive by to check on its progress (the house was built on spec; the developer was John Mears, architect Stan Dixon, and builder Benecki Fine Homes), and when the real estate listing went up, I was thrilled to finally get a glimpse of the inside. It was only a glimpse, though; the listing contained only a few dark pictures, and the house was not finished or furnished. The house wasn’t on the market very long, so clearly the poor real estate photos had no impact on the sales value of the house – anyone who saw the inside could immediately sense the quality of the design and its excellent bones. I saved all of the real estate photos, and they provide an interesting dialogue on the story of the house, from spec development to magazine cover. Before the house sold, I was also able to get a tour by architect Stan Dixon, while the house was at the tail end of construction; the house certainly made quite an impression on me. An artist’s rendering of the house, which was included in the real estate listing and was on the sign outside the property while the house was being built. The front door that was originally conceived for the house was solid, with a transom above. Photo above via real estate listing. The door that the developer actually selected for the house had glass, so designer Betty Burgess used portiere curtains to create a sense of privacy from the busy street. What I love about this house is not only the beautiful clean lines (it has been described as ‘French City’, as opposed to ‘French Country’), but also the fact that it presents a relatively modest presence on the street, despite the fact that it is not a small house on the inside. Image via AH&L, photo credit Erica George Dines. The inside courtyard of the house had a grassy center and pea gravel paths. Above photo via real estate listing. The new owner of the house built a pool and paved the sides with bluestone. The doors on the right open to the garage, which can used as auxiliary entertainment space and is decked out with a disco ball and black and white checkerboard floors. Image above via AH&L, photo credit Erica George Dines. The bones of the kitchen, and its layout, are one of many highlights of the interiors. Note the hanging pendant lights from the beam, a clever way to add task lighting to the space. Above photo via real estate listing. The kitchen with interior design by Betty Burgess. I am not sure if the difference in color is because of the dark quality of the real estate picture, or if it was changed. The AH&L picture certainly shows the beautiful color scheme of the kitchen as it translates in real life. Two obvious changes: the island was painted a dark color, and Burgess added the industrial lights above the island. Image above via AH&L, photo credit Erica George Dines. The real estate photos really did nothing for capturing the beautiful bones of the house. Even empty, the library was a gorgeous space. The window on the right is balanced by the bar on the left. Above photo via real estate listing. The exquisite library, as seen in Atlanta Homes & Lifestyles. Burgess acknowledged that this was the darkest room in the house, so she selected royal blue velvet that would ‘pop’ against the warm tone of the paneling. Image above via AH&L, photo credit Erica George Dines. To me, one of the most interesting rooms in the house is the living room. I was wondering how a designer would tackle the space, which is quite wide, with doors in each corner. Above photo via real estate listing. Burgess handled it beautifully by setting up one side of the room in a more formal way (as seen in the vertical picture, with the fireplace as the focal point), and the other side of the room in a more casual way (seen on the left of the horizontal picture), with a TV as the focal point (the TV can be hidden by a set of sliding antique doors). Image above via AH&L, photo credit Erica George Dines. The formal powder room really caught my eye when I first saw this house (Stan gave me a tour when construction was almost finished). Because this bathroom is not used for any of the activities that require a mirror above the sink, Stan placed the sink below a window, and the window has a great view. Stan said that a mirror could easily be placed on the adjacent wall. Above photo via real estate listing. The powder room after Betty Burgess layered on the decorative elements. As Stan envisioned, there is a mirror on the side. I love how Betty had the window trim and sink base painted a glossy black, and I particularly love that dramatic wallpaper with matching fabric on the bench. Image above via AH&L, photo credit Erica George Dines. This house has captured the imagination of so many in Atlanta; despite the fact that the house is only a few years old, many cite it as one of their favorite houses in Atlanta. Clearly the house has also captured the imagination of the blogosphere given how many blogs I have seen it on. Do you have a favorite room in the house? For the entire article, please click here - ‘Perfect Pitch’, by Heather Paper, photos by Erica George Dines. To subscribe to Atlanta Homes & Lifestyles, click here. Atlanta Homes & Lifestyles has a new iPad app, where digital copies of the magazine can be purchased for .99. Check it out! Please visit Metamorphosis Monday for other inspiring posts and transformation stories! Thanks for saving the real estate listing photos and showing them to us together with the AH&L photos. As I was looking at the magazine photos when the issue came out, I kept thinking about the listing photos and how different the house looks now. Great to see them side by side. I loved the side by side as well. Photography makes all the difference, lighting etc, take from drab to amazing. I was knocked off my seat by the powder room transition, took me totally by surprise and I found myself going back and forth between the before and after photos. Curious to see what that black and white floor in the garage with the disco ball looks like. I just posted this a few days ago....so lovely to now know the history as well! I always learn something from your posts. Beautiful home. Have a great Sunday. That bathroom is gorgeous. Great post. Great post Holly, I love the before and after pictures - those real estate photos couldn't have been less flattering! But do you know what my favourite bit is? The very first shot. I love the way the design of the house has maintained the 'doll house' cube, standing proud of the rest, and yet has so much more space to offer behind. I have often wondered about extending our house, but it is difficult to work out how an extension could be added without spoiling the lovely symmetry, or looking like a wart stuck onto the side of the house. This home is real inspiration - thank you! PS I'd love to see the sketch of your staircase! well I'm completely gobsmacked by this before/after set of pics - just amazing - the kitchen is unrecognisable until you take a really close look. Just amazing! Fabulous house and so glad to see the before and after, Ms. Burgess did a wonderful job. The outside of the house is to die for! Another change that I can see made in the kitchen was that the wood around the windows were also painted dark like the island. The cabinet hardware was also changed out into a dark metal. Amazing transformation, the black window detail on the interior of the frames is very striking. I have done that in one house before and it really does add a wow factor to every room. Would love to see a sketch of the floor plan - any ideas how to find one? Love this house! I loved everything about this post. Makes such a strong point on the value of capturing a home to the best of its ability photographically. Worth every penny. Erica is a true master and a pleasure to work with. There are so many smart designs in this house. Yes, we need floorplans of this beauty. Maybe it should be etched in stone? Disco Garage! Please invite me to the next party. It's a terrific idea; why waste a garage on just cars? I love the glass front door. It makes for a striking, see-through view as you drive by. It may be an even better effect looking from the pool area back out towards the street. It's as if you are seeing to infinity. What bugs me a tiny bit is the mantel/chimney breast over the range. I know it's the thing for grand kitchens these days. But my eye wants to look out of the windows and the chimney seems in the way blocking my view. Seeing it in person might change my mind. I think that I could live in the powder room. Fantastic, unexpected choices. You always provide a great tour of truly exceptional homes! The architecture and grounds are stunning. And, I have always admired Betty Burgess, I have so many tear sheet saved of her work. She often incorporates black in dramatic ways into her spaces. And, everytime I see this wallpaper, I fall in love with it. But this powder room...is simply to die for!!! Holly, you are so right...amazing the difference between the real estate listings and how the home truly looks. Beautiful interiors...took my breath away. Thanks for sharing. This home is amazingly beautiful! Love the kitchen. Beautiful! It's official, I'm getting a subscription to Atlanta Homes & Lifestyles - such a great magazine. Thanks for sharing! Thank you for the comments, everyone! I had not noticed that the window mullions were painted black in the 'new' kitchen. This is what my architect and designer suggested for my kitchen, so it is great to see how effective it is! I love that powder room too. I saw this house about 9 months before we started the design of our house, and it certainly has had an influence on the design of my house, but that is also because it already had a lot of elements that I want: sophisticated French influence, very few hallways, rooms opening into other rooms, 'U' shaped design, upstairs den. Whenever people see a sketch of the outside of my house, they remark that it reminds them of this house. But, my house has its own unique features and characteristics, of course. My lot is wider and deeper, and much of what defined the footprint of this house was the 100' width of the lot. Beautiful transformation by the talented Ms. Burgess. I remember liking that powder room when you showed it in an earlier post but now I love it! The kitchen looks so much better with the cabinets painted a fresh white, the island a darker colour and the window frame and muntins painted black - the power of paint! What a beautiful home, I love each awesome detail! Thanks for sharing! This post is DIVINE! Your blog is one of the best out there, bar none. Kind regards, Ellen from The Netherlands. I read this lovely AH&L cover story and have been admiring this house (that kitchen is to die for--definitely my favorite space). Seeing these real estate pics adds another dimension, truly a tale of the power of great design and a photographer who understands the nuances. Great post! i took this issue to the beach with me a few weeks ago and pooped in my pants when i saw this particular house. i just stared and stared. betty turned this one out! This home is just crazy good. I am loving all the details. Hard to believe this was a spec house. Only in Atlanta. The designer did an amazing job. I love that powder room! Between the glossy black and the bold wallpaper, it really is striking! Wow! Every once in awhile I see a home that I love so much it actually annoys me that I don't live there...seriously, its demented but true, it puts me in a bad mood! The pool, the disco ball, that powder room! This is one of those houses! Off to kick my walls! I love seeing these photos. Thanks for sharing them. She did a fabulous job! I cannot get over the powder room! I'll always love rooms with creeping vine wall paper. Also, the blue of the pool is exquisite and the royal blue velvet is a perfectly pared with paneling. Crisp. Clean. Tempered Luxury. SUCH a fabulous house. I am crazy about the blue accents in the study. What as stunning home!! Amazing how the drawing before looks almost identical. I love the bluestone around the pool... just stunning! Perfect post, I love the before and afters that I would have never seen without this post. Great. As Dame Edna would say:"It's deceptively spacious--it looks spacious from the outside and it's even MORE spacious on the inside." I liked the plain white/gray? kitchen. Great post. Thanks for sharing. That house is truly beautiful! I loved seeing the before and afters. It is amazing the difference it makes. What a fun post! I love the before and afters. The powder room, kitchen and living room transformations are incredible. I think I liked the courtyard with grass and pea gravel though. Thank you for the tour and visit of this magnificent home! Breathtaking! That blue and tan combo is so striking on the cover of AH&L. Love the flowering quince on the bench as well as the walls, the look is almost modern! What's up w/ the basket of flowers on the kitchen counter in the real estate photo? They should have called Blayne, if only to save themselves from that embarrassment! Agreed! This is a fantastic home. I toured it last year and was equally impressed with all the rooms you show. I also loved the design of the cigar room in the terrace level with the steel doors/window used on the interior. Great post! Holly, Love your blog!I toured this home back in the spring and didn't want to leave. I loved the kitchen, you can walk through the doors to the right of the refrigerator and go to a hidden pantry with a window in it. I loved the oval foyer. I think it was oval?. I also was in heaven on the lower level in the guest room. It had 2 double beds with bed hangings...beautiful! Thanks so much for taking me back there. Oh my goodness...WHAT a beautiful house!! How fortunate that you got to see it before it was all done. What an amazing transformation!! Thanks for sharing! Now that is my kind of kitchen!! I love the before and after. Thanks for sharing! Stunning house! Thank you for the post. Beautiful home and loved to see the listing photos with the finished product. Interesting and beautiful design solutions. There isn't anything I don't love about this house! To me, it is a dream home. I love seeing the powder bath go from wow to wowza! And...funny enough, one of my favorite things is that sweet little awning looking toward the back yard. This home is fabulous! I've seen it on a few interior design sites and it truly is one of a kind. The idea to use curtains to block view from the busy street is a marvelous idea. I came across your post this afternoon while browsing interior design blogs and the topic of window treatment selection was very interesting to me. It is true that you must dress your windows appropriately to bring out their true beauty. Thank you for writing and as a special thanks to you and your readers, I would like to offer a 20% off coupon using this code upon checkout: BLG20. I think this house is one of my all time favorites. Just the right amount of everything.. I am always excited to see what a great designer can do in a space. Beautiful!!!!! I'm not fond of the kitchen light fixtures, though. Everything else gets my approval! This house blows my socks off! Wow! I love all of the unique details, including the interesting kitchen beams & lighting, as well as the doors that open off of the pool into the garage to serve as extra entertaining space! The room with the royal blue sofa is just exquisite! Thank you for sharing this post! That home inspires me to capture it in an illustration in my style. I might have to leave a glass slipper by the front, it really is something out of a "Cinderalla" story~ Fit for a Princess. I too am in love with classic architecture. Thanks for the great images. I am absolutely smitten with that Stan Dixon house, especially the powder room. I've always said that powder rooms need to wow you and that one certainly does.